Nearly every settlement in the Inner Sea has at least one temple, ranging from the modest shrines of remote hamlets to massive cathedrals in metropolises. Temples can act as centers of commerce, community, healing, and sacrifice for adventurers and common folk alike. Pathfinder Campaign Setting: Inner Sea Temples helps Game Masters and players explore six of the Inner Sea region's most iconic seats of faith. Each entry comes complete with a detailed map and gazetteer; profiles of the temple's notable members; a history of the structure and the organization of its clergy; and a wealth of magic items, occult rituals, and spells favored by the resident priests. 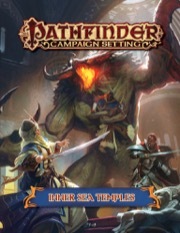 Inner Sea Temples is intended for use with the Pathfinder Roleplaying Game and Pathfinder Campaign Setting, but can easily adapted to any fantasy world. The interior cover has a map of Avistan and northern Garund with icons that show the six temples from the outside and place them on the map. There is a sample cleric (level) 5 on page 2 for placement in the locations. Each of the 10-page sections has a sidebox which describes how to customize this priest to each deity. Each temple gets an (upper half) 2-page spread of an interior view (with the rest being history and organisation description), a half-page outer view, a full-page "flip-mat"-style birdsview, four pages of room descriptions and two pages of magic items and spells. The outer view and 2 page interior illustrations are gorgeous. The "High Temple of Pharasma" fits on a "bigger Flip-mat", as does "Imvrildara". Most magic items and spells are either very flavorfull, useful or both. Half of the full-body illustrations for NPCs are so dark, that details are hard to make out. Four temples are too big to draw on a bigger flip-mat, one doesn´t even fit on two! None but the first and last temples scream "adventure location that needs to be fully depicted" to me. The challenge rating for the largest Zon-Kuthon temple of Nidal is way too low with a maximum of CR 10. None of the high priests of the supposedly largest and/or most prominent temples of six gods in Golarion are awe-inspiring. There are no adventure- or quest-ideas presented at all. A good book if you need pre-drawn high-temple locations for low-level characters or some very thematic magic items or spells for Zon-Kuthon, Caiden Cailean, Abadar, Pharasma, Sarenrae or Calistria. But you still have to come up with your own adventure seeds or NPC stats for characters higher than level 8. Announced for September! Product image and description are provisional and subject to change. Great cover and great idea! Yeah I love the cover, even if the image might change. Not sold this one, will have to wait and see. Anything with Golarion religion is a much anticipated installment for me. I think that's Inner Sea Brothels. No I'm pretty sure it's Brothels, Gorbacz. Brothels? There are no brothels, my friend. Only dance halls. You're here to dance, aren't you? AREN'T YOU? To dance the horizontal? Yes. Don't worry Gorbacz, I am not the only person that post stuff like that. I'm pretty sure that's your shtick. But don't worry, I'll cover this for you. I have been asking for this one for a while....but only six temples...I want more. I hope on of the temples cover is one of Calistria. Besides being my favorite Golarion Goddess...those of us that have been pushing for a Brothels of Golarion can get a taste. So we know temples Cayden Cailean, Abadar, and Zon-Kuthon are being covered...any guess or wish list for the others? Though a temple of Urgathoa in Geb would be nice. Fully support an Urgathoa temple! Is this going to be "dungeon" style write-ups like Tombs of Golarion, or more of a descriptive text type thing? Does anyone know where the place-holder cover art is from? It depicts the Blood Queen, a horror of ancient Ghol-Gan and the alien queen of the kuru. Nifty! How alien are we talking here - Far Realm-like, off-world but still Material Plane, or just a souped-up Aberration type? Hey, keep it old school: Feast Halls. ... I'm okay with dis. Festhalls. One word. Well, at least if my old copy of Volo's Guide to Waterdeep is anything to go by. Oooo, I did not know about these. Wonder if they are going to include the Starstone Cathedral in this? Despite its name it isn't a place of worship for any god so I would assume no. I was under the impression it actually was. Though it also weirdly does have an attached mythic dungeon. No David. There's not religious stuff going on there. Just people seeking divinity. It's completely different. What a great thing to release! The pathfinderwiki does a good summary of what we know, which isn't very much. People only enter the cathedral if they want to become gods. I don't think it would be fair to simply call it a mythic dungeon either, the whole place is above and beyond anything you might call a temple or a dungeon. I hope we get a temple / shrine to Arshea based in Magnimar in this manual. I hope we get previews soon. Time for some subliminal messaging then! I hope we're getting some previews during PaizoCon. Inner Sea Lonely Planet edition. Anything you need for the Inner Sea, everything you could think of and a lot more. I agree, Vudra, Casmaron and Arcadia could use some lovin'. Well technically any place outside the Inner Sea could use some lovin'. While i would love to see a product about another continent one day, it makes more sense to flesh out Avistan and Garund with Campaign Settings before. An entire landmass takes much more time to create and i for one would like to get my hands on a "Brevoy", "Kyonin", "Five Kings Mountains" and even "Varisia" book more than on a Casmaron one. Tian Xia would make more sense than something all-new too. But i am sure we will get another continent in the next few years. Complete Golarion Manual in 2025! I so agree with all of this! Still so much to detail with the Inner Sea. 2025 might be a realistic date, because the average "old school" grumbler person might be looking for a retirement home then and ... oh wait, then they have pension and even more time on their hands.